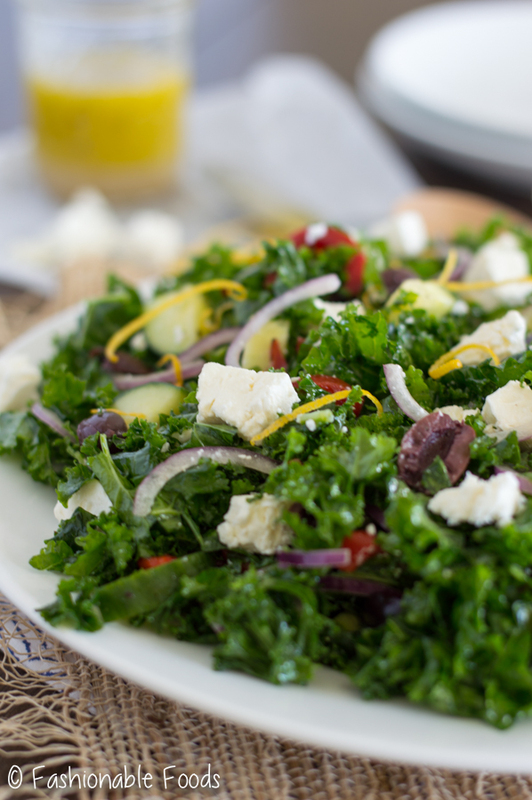 A classic salad gets a nutritious upgrade with my favorite salad green: kale! 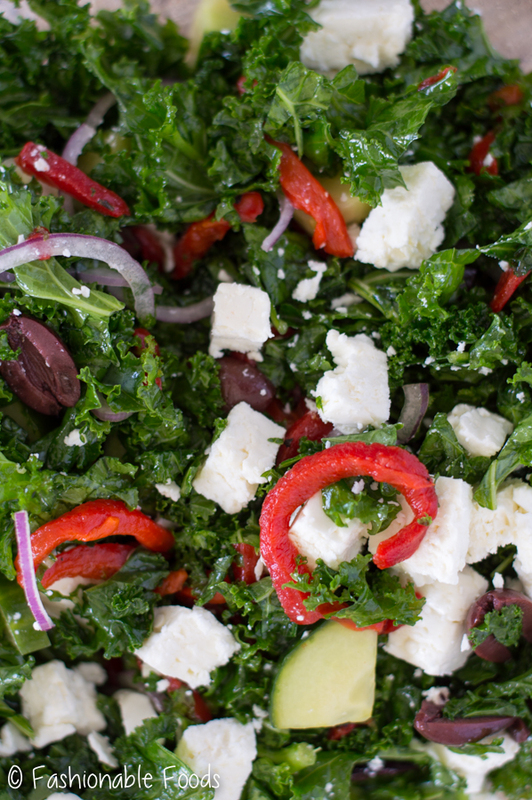 This Greek kale salad is full of texture and delicious flavor. Can you believe it’s March?! I know I say this all the time, but time is flying. I seriously feel like January 1st was just yesterday. Crazy! Speaking of crazy, the weather has been INSANE here. We had so many warm days in February.. it actually felt like summer last Friday. Tuesday was another 70 degree day, so I thought a few minutes outside in my lounge chair would be a good idea. I sat down with my iPad ready to browse for recipe inspiration when I felt something on my arm. I look down and there’s a spider on me. I jump off the chair and see that it’s a BLACK WIDOW. A BLACK WIDOW. I think it must have been hiding in a crack under the arm of the chair and decided come out while I was sitting there. Needless to say, I came in the house and had to take a shower to get the creepy crawly feeling to stop. I’m also thinking about burning the chair. Yesterday it was 76 degrees out, but with some intense wind. A storm rolled in that looked like a hurricane… debris flying all over the place. Now tomorrow they are calling for an inch of snow and cold temps. WHAT?! Absolute craziness. 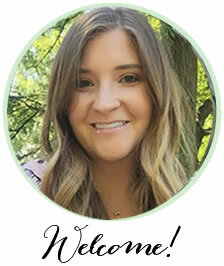 Ok, enough about the weather… let’s talk about why you’re here. FOOD. Y’all know how much I love kale. 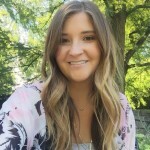 I eat it at least once a day in some form or another… typically in a salad, but sometimes sautéed as a side dish, or even with my eggs in the morning. I just love it! 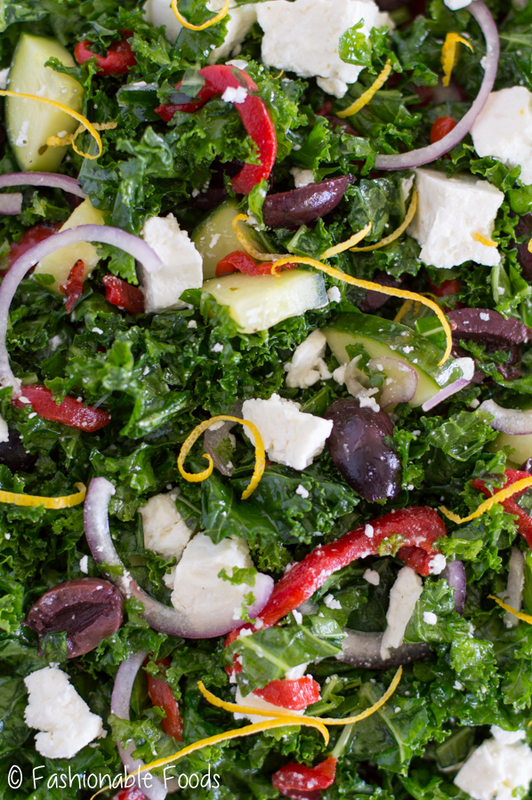 Greek salads are one of my favorite salads ever because … feta. So, it was only natural that I combine my favorite green with my favorite salad. Match made in heaven! Even Kyle ate this one. 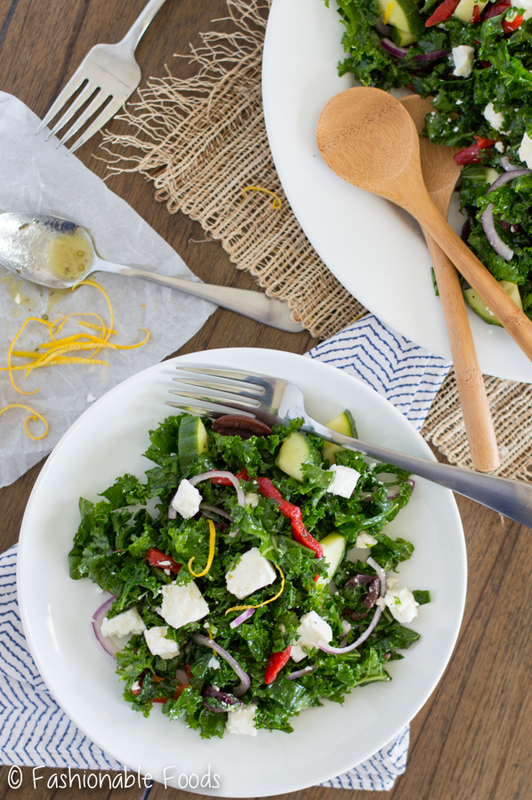 He hates kale salads, but he ate this one because… feta. Basically feta makes everything better. 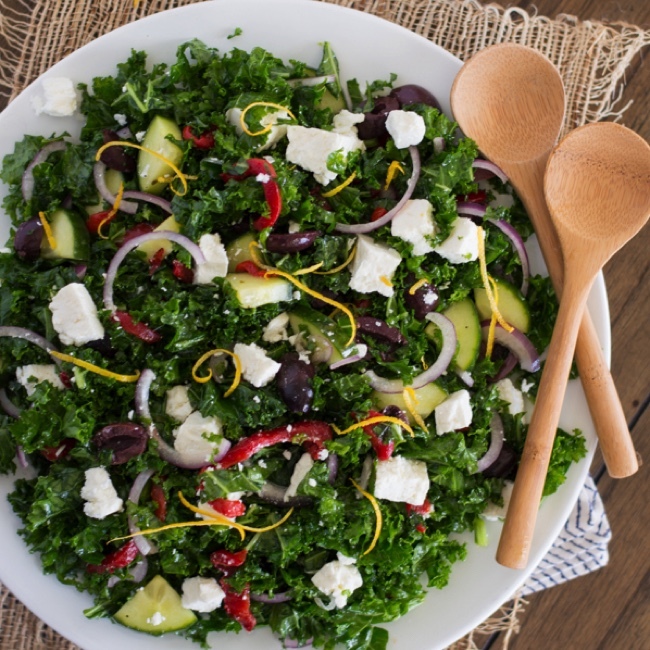 Did you know traditional greek salads don’t even contain lettuce? It’s usually tomatoes, cucumbers, green peppers, kalamatta olives, and chunks of feta. Good thing this salad isn’t traditional. ? Instead of tomatoes I used roasted red peppers since tomatoes are out of season. I can’t deal with the flavorless tomatoes this time of year, so I avoid them. But, if you can get your hands on some good ones, by all means use ’em! The vinaigrette for this salad is super simple. Lemon juice, dijon mustard, salt, pepper, a hint of garlic, olive oil, and oregano. I LOVE dried oregano. I’m usually a fresh herb kinda gal, but when it comes to oregano I really love the dried. I love the fresh too, but I don’t often have that hanging in my fridge. My mouth is watering just looking at this salad. Yes, it’s that good! It’s the perfect salad to take us into spring, which has certainly made a few appearances. The best part of this salad? Well, any kale salad for that matter. It keeps in the fridge for DAYS! I enjoyed this as a side dish to grilled chicken and asparagus one night and then leftover for two days after topped with leftover grilled chicken. 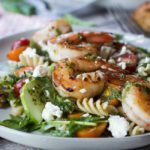 It would also be delicious topped with shrimp! Well, that’s all she wrote, folks. <— See what I did there? Anyway, have a fantastic weekend! Combine the vinaigrette ingredients in a small mason jar. Place the lid on tightly and shake vigorously to combine. Place the sliced red onion in a small bowl and cover with cold water. Set aside. 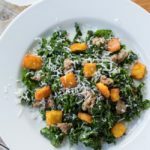 Place the kale in a large bowl and massage it by taking handfuls and squeezing. Once it begins to soften and take on a cooked appearance, toss it with 2 tablespoons of the vinaigrette. Drain the red onions and add them, the cucumber, red peppers, olives, and feta. Toss the salad well and serve, adding more of the vinaigrette if necessary. 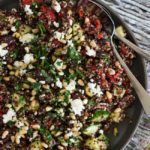 *I used roasted red peppers instead of tomatoes, which are more typical in Greek salads. Tomatoes would be preferred, but since they are out of season I went with roasted red peppers. Feel free to use whichever you like! Good grief! I think I would have a heart attack if a black widow came creeping up on me! Thank goodness you have this amazing salad to keep your mind off of that! 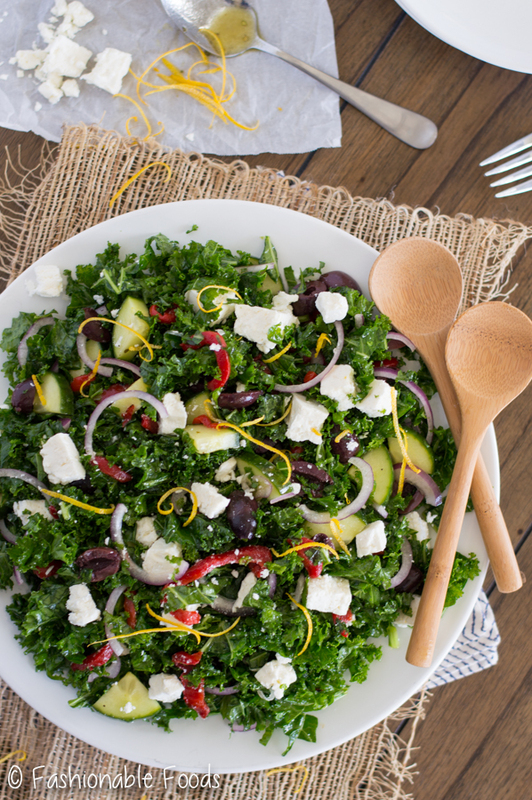 I think Greek salads are probably my favorite and love the kale in here! Time is definitely flying by! I’m glad though, because I dislike January and February because of the cold weather. 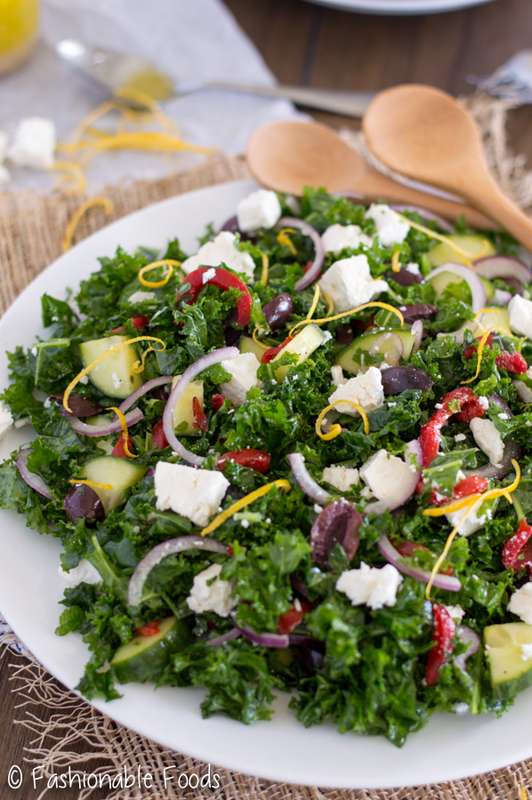 This Greek kale salad looks gorgeous, Keri! I’m loving those olives and that vinaigrette with garlic. Sounds like the perfect light lunch or dinner! I agree with you there, Gayle… cold weather months always seem to drag on, so I’m happy they are gone! Thanks for the Greek salad love!